For some reason, as I write these up, it seems more natural to do so in the reverse order of when they happened. I’ve already described the eclipse itself (and I guess I really had to write about that before it got too stale) on the 21st and my visit to the Garden of the Gods the day before, the 20th. So let me move on to the 19th. Actually, on the day before that, my first full day there, I stopped at the Barkhousen-Cache River Wetlands Center. 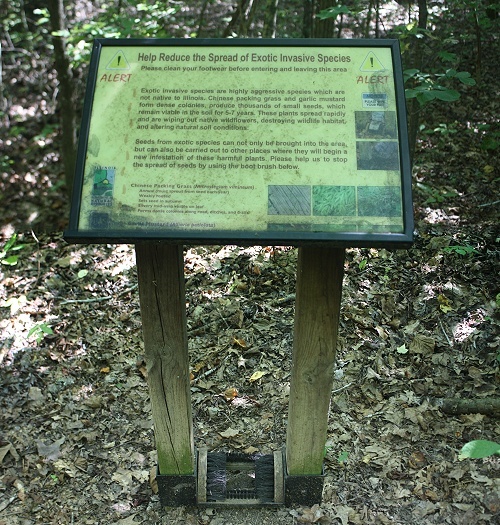 They have a nice huge display there with a history of the area, a description of wetlands and the nature contained within them, and a few wetlands animals on display (including turtles and snakes—a copperhead, a cottonmouth, and a rattlesnake). Here’s the view from just outside the building, at the start of a short walk. 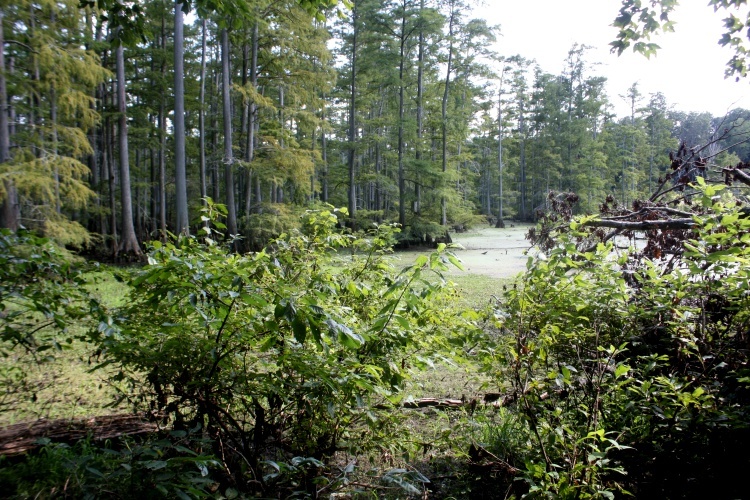 You’ll notice all of the reeds and grasses, and the bald cypress tree to the right. Of course I was barefoot, which led to an odd conversation. Another man who was visiting asked me if I drove barefoot. I told him yes, and he said that in Waterloo (Illinois, a bit outside St. Louis) the cops regularly gave people tickets for driving barefoot. Very odd, since we know it’s not against the law at all. I let him know that, and told him that if anybody ever fought the ticket, they’d beat it. Anyways, at the Wetlands Center I also was able to pick up maps and also tips to supplement all the stuff I’d brought with me. 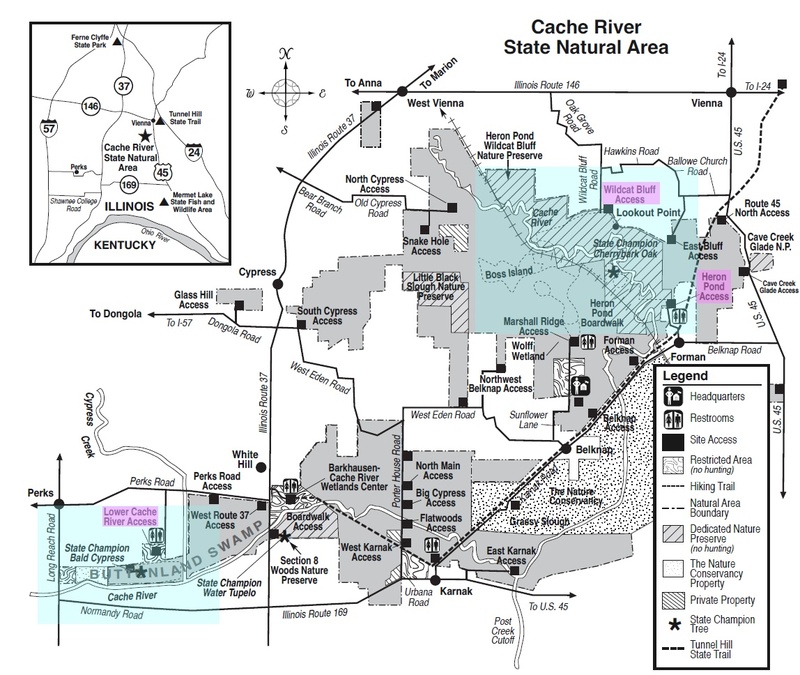 Here’s the main map of the whole Cache River State Natural Area. On Saturday, the 19th, I hiked a bit over in the Heron Pond area, which I’ve highlighted in light blue in the upper right. 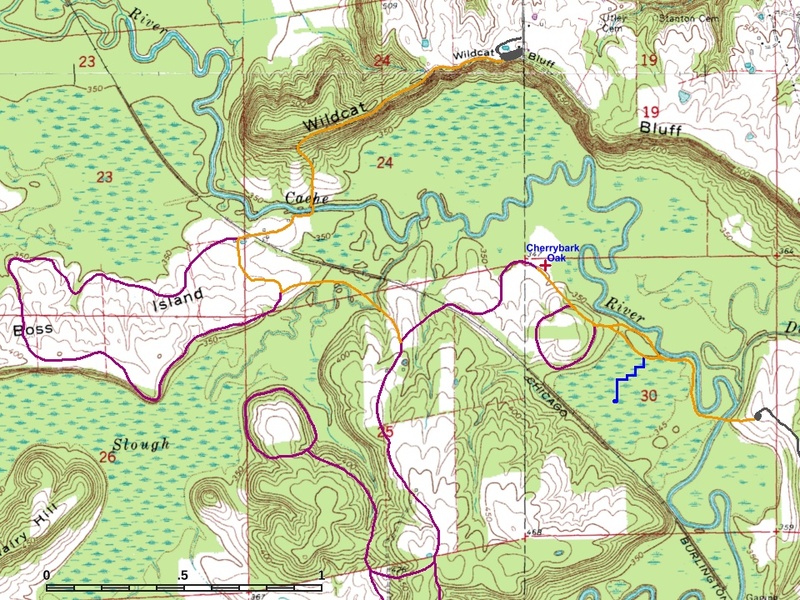 Here’s my topo map, with trails, for that area (of course I have a topo map!). My plan was to start at the Wildcat Bluff Access point (look at the first map again) and head to the State Champion Cherrybark Oak. It looked like that would take me near some neat swampland and after that, who doesn’t like to look at huge trees? 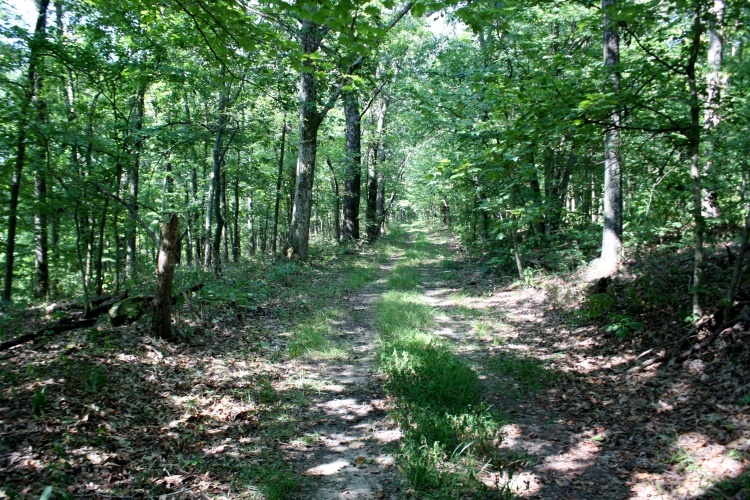 The trail started by going about a mile along the top of the bluffs, and obviously was following and old road. You can follow my route on the topo map; I’ve marked it in orange. Eventually the bluffs ran out and the trail descended down to the Cache River. The crossing point had these odd concrete buttons(?) to walk across on. 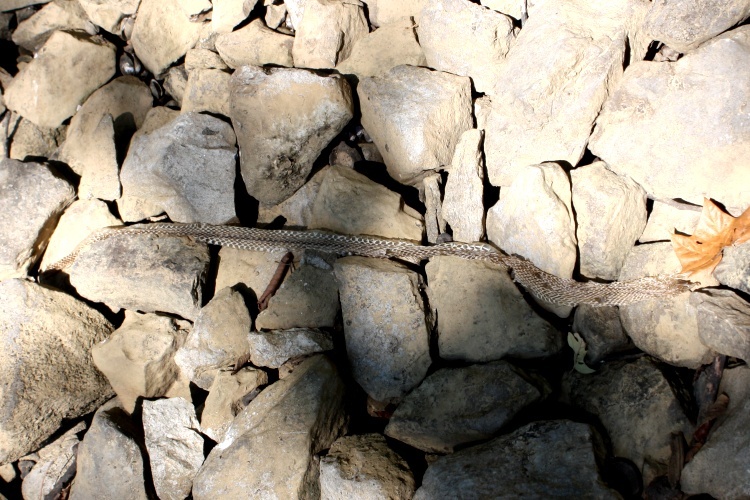 As I was hopping across, I managed to disturb a cottonmouth below me in the water. It quickly disappeared under some rocks and debris before I could get my camera out, so no picture, I’m afraid. On the other hand, it did leave a slightly slower-moving souvenir for me to take a picture of. I spent a bit of time walking along the Cache River. It was decidedly non-swampy, which was rather disappointing. There was a reason for that, though. The area used to be swampland, and the only industry there was timber. The Cache River wandered way off to the west as it slowly made its way to the Ohio River. 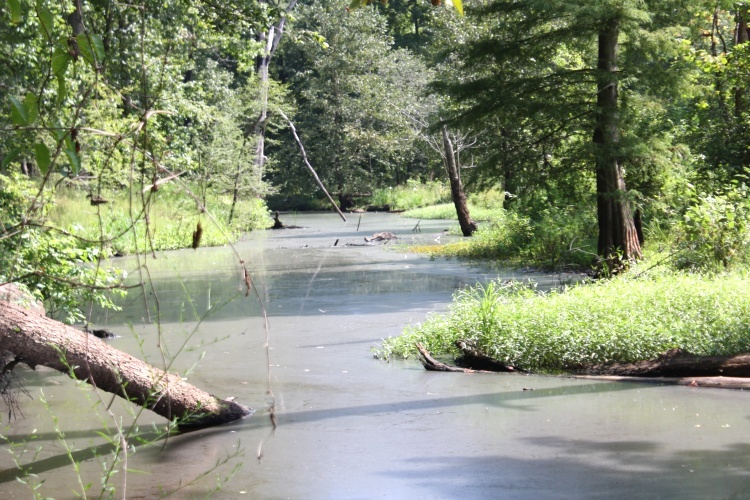 But in the early 1900s, they dug the Post Creek Cutoff through some southern hills more directly to the Ohio. This drained everything upstream, leading to agriculture. This better flowage also cut down the original banks of the Cache River, which is why what you see in the picture isn’t even close to a swamp, just a regular creek bed. 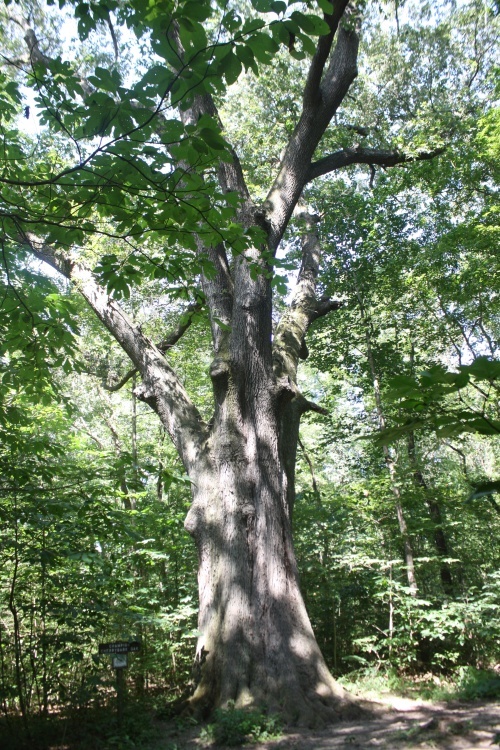 Eventually, after about an hour and a half, I made it to the trail that led to the Cherrybark Oak. But I’d had enough. An awful lot of the trail had been chipped limestone, which is awful to hike on barefooted. You can see what it looked like in this picture at the intersection. The main trouble with chipped limestone is that it’s all pointy. They take big chunks of limestone and break it up, and that leaves it sharp. River gravel, which has been rounded by the flowing water, it much easier for hiking barefoot, but somehow trailmakers don’t even consider that people might enjoy nature in some different way. The chipped limestone also meant I had to walk a bit gingerly, and that slowed me down. I kind of wanted to be back at camp by 1:00. Why? Because I wanted to make sure that the opening near my campsite would give me a good view of the eclipse. I did make it back in time, and I did confirm that I’d have a good view. However, I hadn’t made it to the State Champion Cherrybark Oak. So I headed back to the Cache River State Natural Area, but this I time I started at the Heron Pond Access point. Again, horrible chipped limestone. But I just took it slowly and easily and before too long, I was at the Oak. It may not be easy to tell just how big it is. How about I put a person next to it? On the way to the Oak, I took the main path closest to the Cache River. On the way back, I took the spur that went alongside Heron Pond. 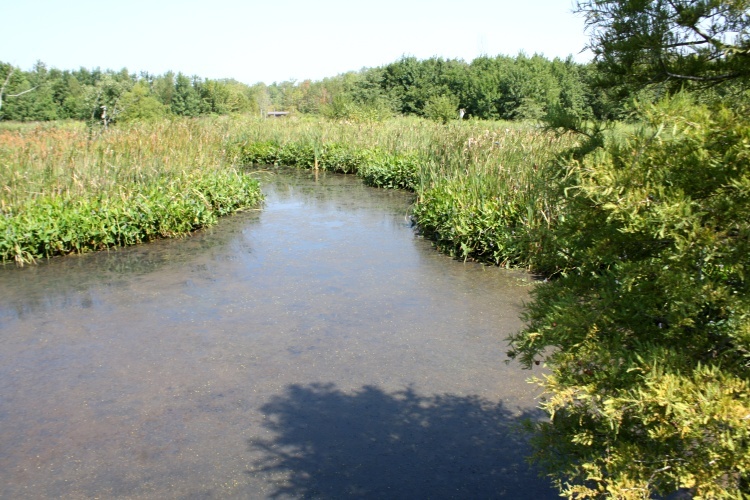 The pond was rather reduced in size and large sections of it had dried (the Post Creek Cutoff, remember). But it was also clear that the water levels were much higher in the spring. And there were bald cypresses. You may recall that I have a love affair with bald cypresses. I love the way that they are conifers that lose their leaves in the winter. I love the way the bases of their trunks have flying buttresses. I love the way they put up knees a fair distance from their main trunks. I have something like a dozen of them on my own property. So I was in heaven. Here’s another shot of Heron Pond where there is actually water. 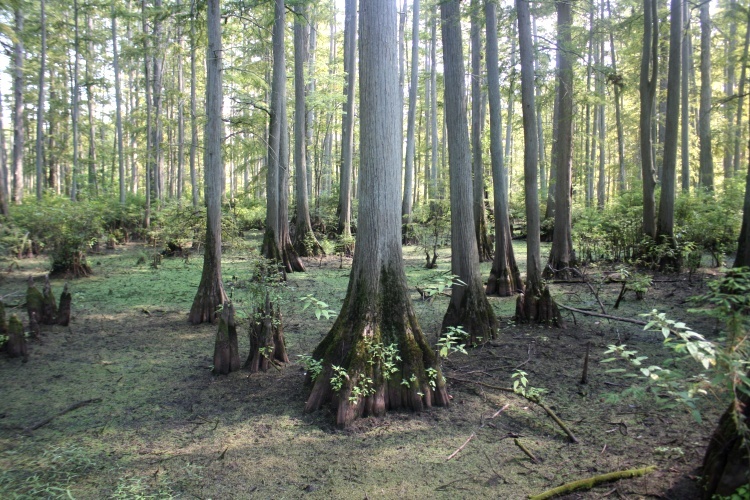 Did I mention that bald cypresses put out knees? They send runners a fair distance and then the knees shoot up, sometimes up to maybe a foot and a half. The standard explanation is that these provide air to roots submerged in water. 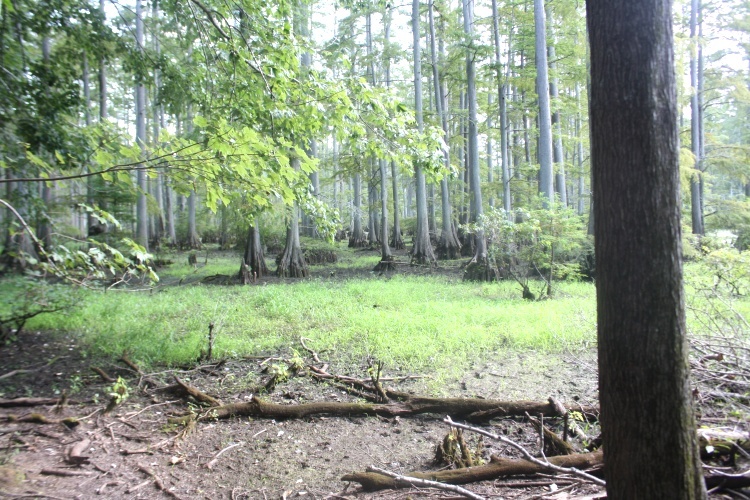 But the Wetlands Center also said that they provide the tree with much better stability in the loose and unstable swamplands. 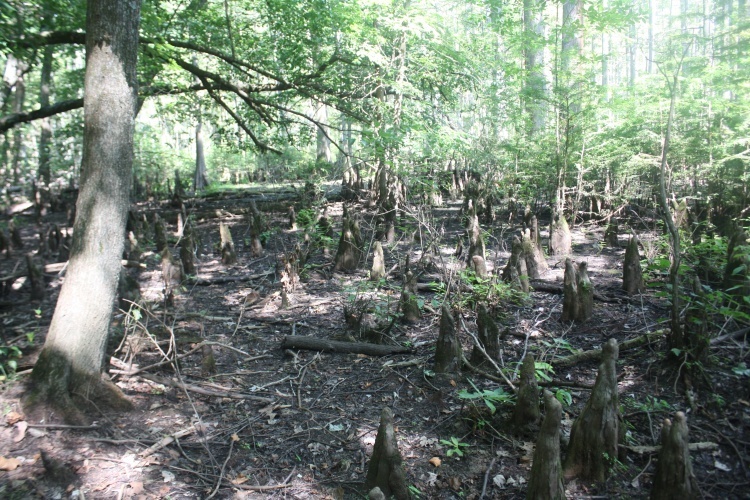 So, here’s a little forest of knees. 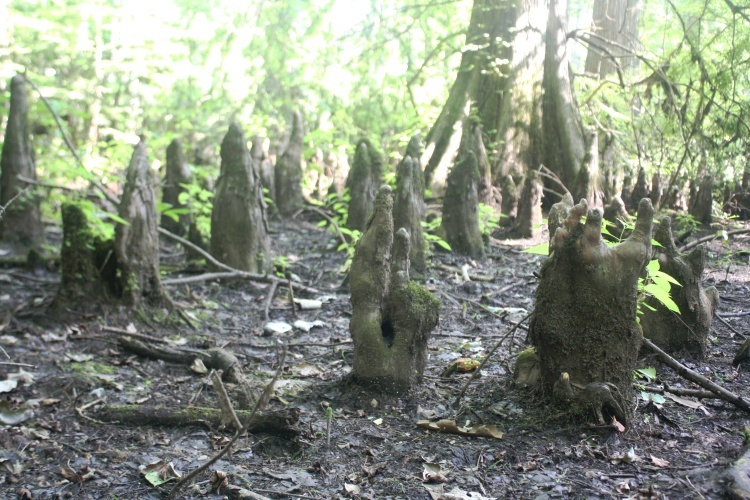 And would you like a close-up study of cypress knees? Heron Pond also had a floating boardwalk that extended out towards the middle. Except when I was there it wasn’t floating; not enough water (blame the Post Creek Cutoff again). From here, I made my way back to the car. Over the day, I probably hiked over about 4-5 miles of gravel. It wasn’t pleasant, but it was doable. The next day, when I was at the Garden of the Gods, I spent some time hiking with a group I fell in with (from Columbus, Ohio, of all things—Akron, too). 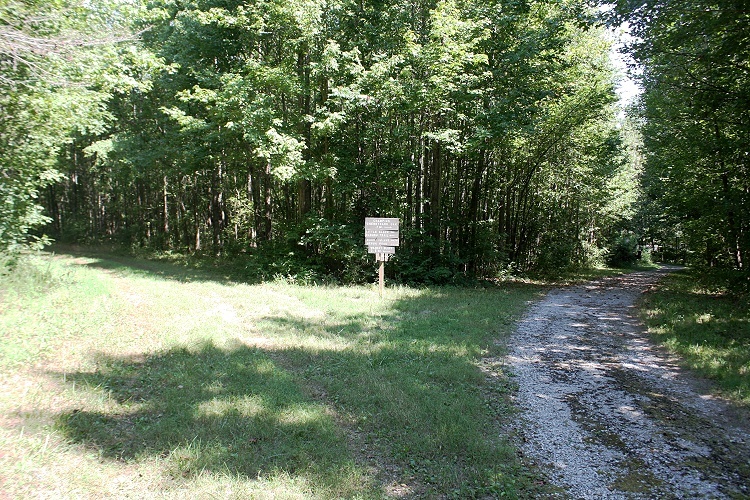 When I got to the backpackers parking lot (gravel, of course), I walked across it without too much difficulty. I just had to slow down a bit. I apologized, but they were amazed that I was able to walk on it at all. I guess I’m better acclimated than I thought. Finally, right at the Heron Pond parking lot, with this funny little sign and object. Please clean your footwear before entering and leaving this area. And you can see the multiple shoe brushes at the bottom. This is not a problem if you go barefoot. You don’t have tread or shoelaces collecting those foreign invasives. And your feet get washed and cleaned fairly often. It’s clear that this “Nature Area” doesn’t think that hiking barefoot is part of nature. They convey that the most by paving their paths with chipped limestone. That’s not “nature” at all. But I guess such irony is beyond them.